Radiant heat is a form of energy that heats objects through a conversion process. Radiant heat is also called Infrared Energy. It is not visible to the human eye but we can feel this type of light which we perceive as heat. Why is Infrared Therapy different? A conventional sauna must rely on indirect means of heat. First on air currents and then direct contact of hot air with the skin to produce healing effect. In infrared therapy, less then 20% of infrared energy heats the air leaving over 80% available to be directly converted to heat within our bodies. Therefore, an infrared system can warm its user to a much greater depth and much more efficiently then a conventional sauna. It is also easier to breathe in an infrared system. Passive cardiovascular conditioning: The infrared rays penetrate 1.5" into the skin which generates a heating effect deep in the muscle tissue and internal organs and also increases pulse rate without causing stress to the heart. The lower heat range is safe for those concerned about cardiovascular risks. Therefore it is similar to a workout even for those who don't or can't exercise. 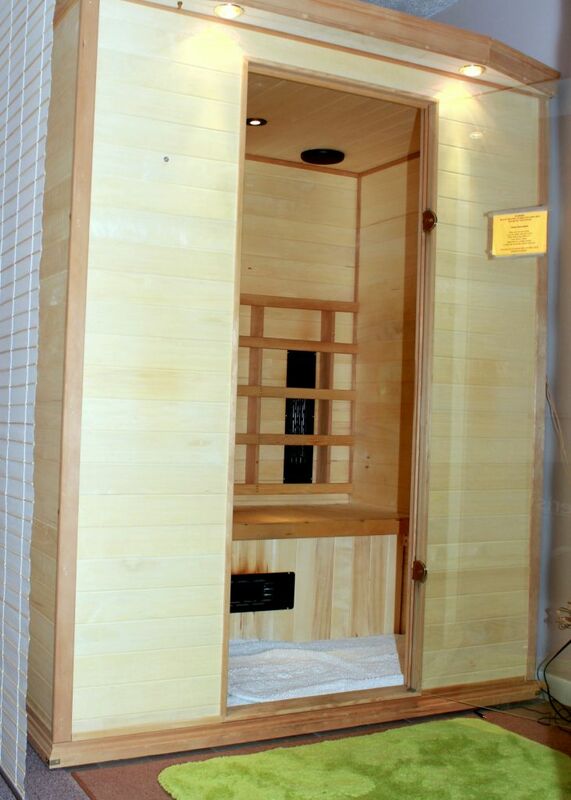 The Infrared System helps generate 2-3 times the sweat produced in a hot air sauna. A moderately conditioned person can easily sweat off 500 grams in a sauna which is similar to running 2-3 miles. Therefore, the infrared system can play an important role in both cardiovascular conditioning and weight control as well as cellular detoxification.